“Since the day I was born I have loved you so much…” were the opening words I penned on a handmade Mother’s Day card back in the 3rd grade. Those were the only words I remember as our teacher was a merciless editor and I think those were the only original words I was allowed to keep in the final version that was sent home to my Mother. I am sure Mom still has the card tucked away somewhere, along with the gold painted broach made from an eye glass lens which accompanied the card. Memories of Mother’s Day stay with us, as children and then as we grow up to become mothers of our own. The celebration of motherhood can be traced back to the Egyptians, but we will fast forward to more current history. There is an excellent website on the history of Mother’s Day for the Jeopardy fans in the crowd. 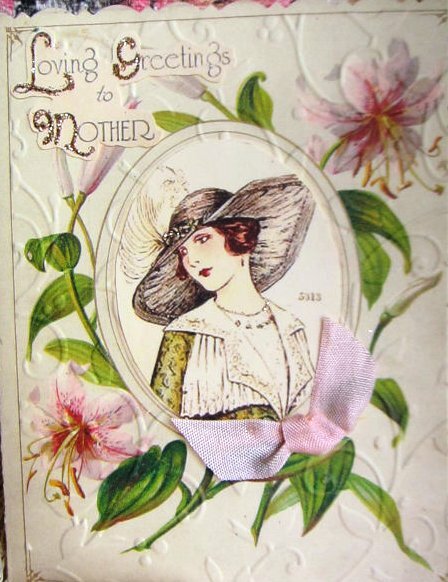 In North America Mother’s Day is celebrated on the second Sunday in May. Currently there are close to 70 countries who officially celebrate Mother’s Day, but at different times of the year and in different ways. Some countries, like France in 1918 with influence from American troops, simply imported the US secular traditions. Others, including countries whose tradition stems from the English Mothering Day, maintain traditions quite different from those of the United States. Still others have ignored or abandoned the more religious and commercial notions of Mother’s Day, choosing instead to focus on women’s issues and women’s rights by celebrating International Women’s Day. For some countries there is religious significance to the day. In the UK Mothering Day falls on the fourth Sunday of Lent. Its origins in early Christianity to honor the Mother Church where Christians were baptized. In Spain Mother’s Day takes place during the Feast of the Immaculate Conception on December 8th. In Ethiopia the holiday is tied to seasons and agriculture, and in Yugoslavia it leads up to Christmas, commemorating the Motherhood of Christ. In North America Mother’s Day is a tribute to commercialism which its founder fought bitterly against. Anna M. Jarvis successfully campaigned to have the first official Mother’s Day celebration held, a tribute to her mother Julia Ward Howe who conceived the Mother’s Day Proclamation back in 1870. When the Americans get a good idea in their heads they run with it, and while Anna dedicated her life to making Mother’s Day an official holiday (Woodrow Wilson declared it in 1914), she spent as much effort to stop the exploitation of the Mother’s Day, particularly by the flower industry who continue to profit. The end of Anna’s story is that she died in 1948, blind, poor and childless. Ironically, The Florist’s Exchange anonymously paid for her final care. Now that you have an interesting Edwardian period story to share with your mom as you present flowers to her this weekend, you might also consider a present. I have suggested hosting tea for mum, and you might also want to buy her a book. If your mother is a fan of Downton Abbey, and she already has seen all the episodes multiple times over the long winter months, I think the best gift you could offer is The World of Downton Abbey written by Jessica Fellowes who is the niece of Julian Fellowes. I believe the best way to describe it is that this book is as beautiful to look at as it is to read. It is more than a coffee table book with lovely pictures, and much more than a fan tribute with behind the scenes photos of filming at Downton Abbey. While there are some comments from the actors to add some spice, Jessica takes the same care and attention as her uncle to use the Crawley story line to pay tribute to the grand country houses like Highclere Castle where Downton is filmed. She teaches us about Edwardian life and the back story of the characters that we have come to know and love; while it was a different time, some things never change, like devotion to family. It is very much like taking a history class on the Edwardian era, using Downton Abbey as the teaching tool. I would not be surprised if American universities will be launching courses using Downton as a backdrop. Julian Fellowes writes the Foreword as homage to these great houses which were mostly abandoned after the collapse of the agricultural economy. Some were rescued and reinvented as new families used the grand space in different ways. Sadly the vast kitchen and ante rooms behind the green baise door had to go. An interesting tidbit was his reference to his great-aunt Isie who was the model for the Violet Grantham character. There are many books written about this era and various connections to Downton Abbey, which I have listed previously, but this is a great one to start with which your mom will adore. 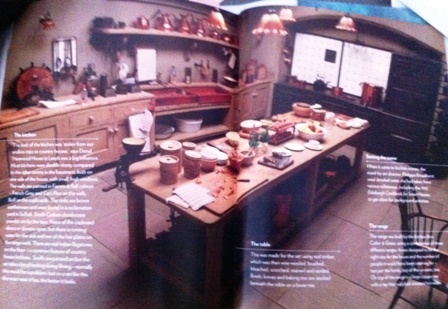 As a foodie there was enough written about the food, the kitchen, as well as Daisy and Mrs. Patmore to keep me entertained. Her reading list is quite extensive. But for most moms who are always quite busy, I am sure they will be happy just to be able to flip through the gorgeous photographs. It helps that Jessica Fellowes is a gracious social networker (@jessicafellowes) and is diligently working on her second Downton book, The Downton Chronicles, so there will be a sequel. It wouldn’t be Mother’s Day or a Downton Abbey Cooks post if we didn’t include some food to celebrate. 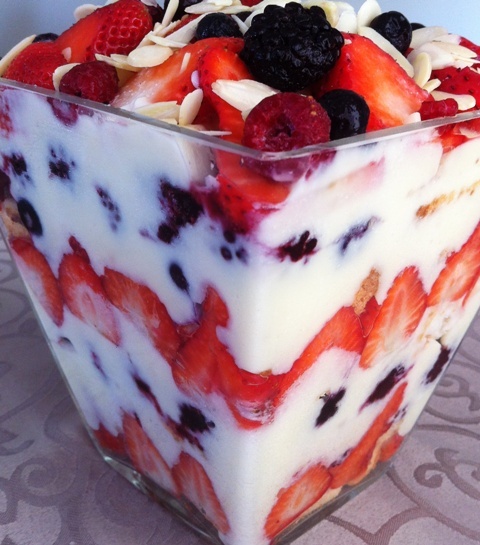 There are some foods that we reserve for special occasions, like Eton Mess traditionally served in June which got me thinking to another simple to assemble traditional English dessert, the trifle.However, if we love our mom we should smother her with love, not calorie loaded desserts which aren’t heart healthy. The traditional English trifle is easy to make, but loaded with calories, but there are ways to lighten the calorie count, simply replace the alcohol (which makes it kid friendly) with the juice from mashed or frozen berries. By replacing sponge with angel food cake we can reduce the fat count and finally, a lower fat custard will provide contentment without guilt. The joy of the recipe is that the kids can help assemble it and can be made ahead of time. And it helps us ring in the summer entertaining season. The custard takes the longest time to prepare but unlike pre-packaged foods you know exactly what is in it, and how many hours did your mother say she was in labour? Cut cake into 2-inch-thick slices and cut slices into rectangles or strips. If you are using fresh fruit, you can either mash up a cup to generate some juices and spread that or some jam on your cake strips. Frozen fruit will generate lots of juice as they melt. Arrange half the cake, jam-side up, in the bottom of a 12-cup serving bowl. If you use a glass bowl or trifle bowl you get extra points for presentation. I have used square glass vases in the past. Arrange half the fruit over the cake layer and spoon half the custard over the fruit. Repeat with remaining cake, fruit and custard. Cover and refrigerate for at least 1 hour. You can make this ahead and let it sit in the fridge overnight or until you are ready to surprise mom. Just before serving, arrange fresh fruit decoratively in the center and sprinkle with the almonds. Whisk together 1/4 cup milk, egg yolks and cornstarch in a large bowl. Heat remaining milk in a heavy saucepan until steaming. Gradually whisk milk into the egg mixture. Return to the saucepan; cook over medium heat, whisking constantly, until the custard boils and thickens, 1 to 2 minutes. Remove from the heat, stir in vanilla. Transfer to a clean bowl and place plastic wrap directly on the surface of the custard to prevent a skin from forming. Set aside to cool slightly. Combine egg whites, sugar, cream of tartar and water in a heatproof mixing bowl large enough to fit over the saucepan of simmering hot water. Set the bowl over the water and beat with an electric mixer at low speed, moving the beaters around the bowl constantly, until an instant-read thermometer registers 140°F (this will take 3 to 5 minutes). Increase the mixer speed to high and continue beating over the heat for a full 3 1/2 minutes. Remove the bowl from the heat and beat the meringue until cool, about 4 minutes. Gradually fold in the meringue into the custard. A great house deserves a great blog…like this one. Good work. Thanks. I look forward to reading your book, Beyond Downton Abbey.